An 8-year-old pupil, whose letter went viral after requesting Santa to prevent children at school from harassing his twin sister, got his appeal accomplished on the “Good Morning America” show. His twin sister, Amber, an enthusiast of the group Big Time Rush, was sung to by her much loved group in New York. The 3rd grade pupil, who experienced harassment at school, was surprised after her icons walked out and sung to her with an exceptional performance, getting a much-wanted beam to her face. The story began after the twins’ mother, Karen Suffern, requested her 8-year-old identical twins to write down a note to Santa with their wishes during the weekend. 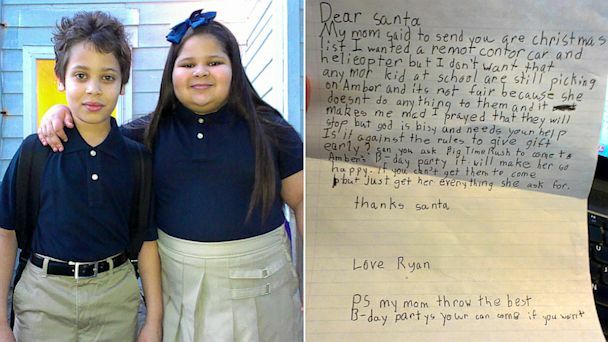 She anticipated to see books, toys, and clothing and was astonished to notice the sincere appeal from her child for Santa to intervene and stop his sister’s harassment. “Dear Santa … I would like a [remote control] helicopter and car; however, I do not desire that any longer. Children at school are still bullying Amber and it’s not right since she does not bother them …,” Ryan wrote. “I pleaded that they will discontinue however god is busy and calls for your assistance. “Is it against the regulations to grant gifts early?” he wrote. Ryan did not end there. He as well inquired for his sister to get together with her favorite group. “Can you request Big Time Rush to attend Amber’s birthday celebration? It will make her very happy. If you cannot make them to come, however just grant her everything she requests. Thanks, Santa,” he wrote. Suffern shared the letter on Facebook with family and some close associates, or so she believed. After her associates shared it online, nevertheless, the letter became viral, making reports across the world since people were moved by Ryan’s remarks. “Good Morning America” noticed Ryan’s letter and co-newscaster Josh Elliott met with the twins and Suffern in New York only to be surprised by her favorite band.